Ocean Alliance has been appointed the MYBA Central Agent for the 105-foot Akhir M/Y MOHASUWEI. The yacht is the newest addition to an impressive fleet managed by the Sydney-based brokerage house in a growing Australian charter market. 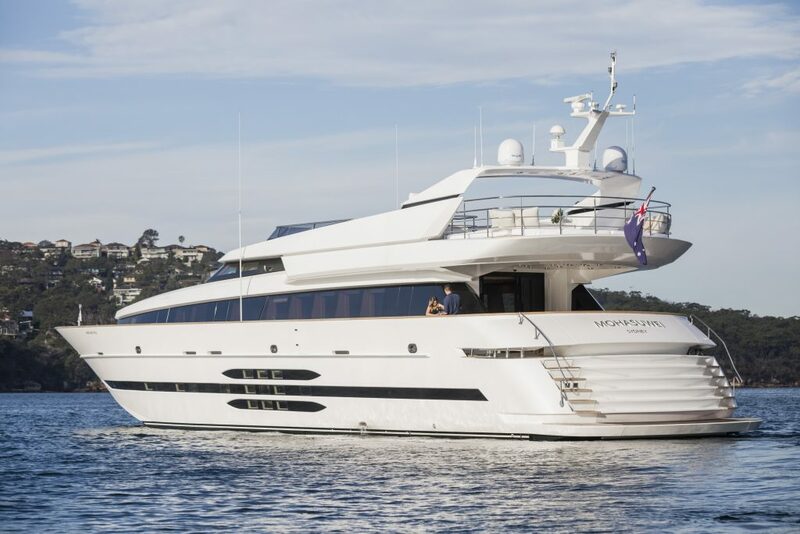 Launched in 2009 by Cantieri di Pisa, MOHASUWEI arrived in Australia in 2017 undergoing a large internal refit to produce a very modern and welcoming interior before launching into the charter market. 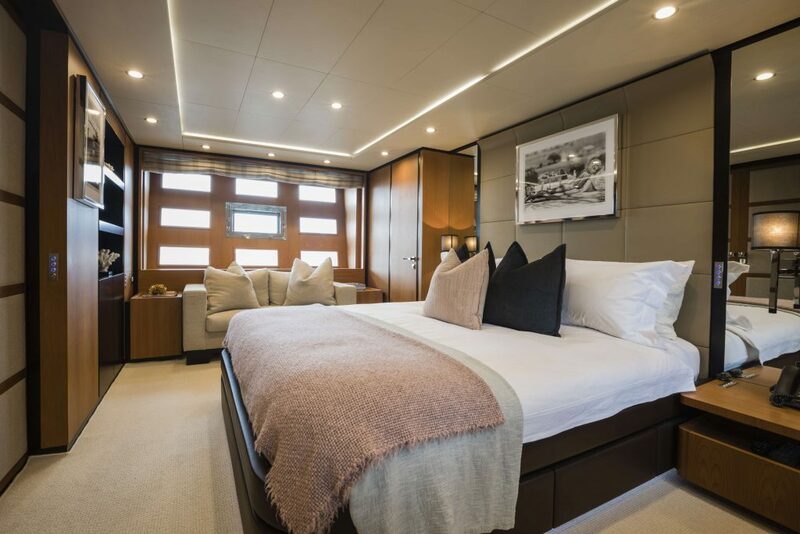 She has accommodation for eight to ten guests in four cabins, all with private ensuites, with the Owner and VIP staterooms enjoying a full beam expanse. Additionally, the yacht is available for event charter for up to 36 people. The interior space features multiple living areas including a large main salon with two separate zones and a cinema room complete with comfortable sofa lounge, surround sound system and its own private ensuite. A unique feature of MOHASUWEI’s interior is the selection of playful and distinctive photography pieces from renowned 1960s photographer, Terry O’Neill. Once outside, the large sun deck offers panoramic views and features both casual dining as well as a large sun pad. The versatile outdoor area on the main deck can either be utilised for formal dining or a more relaxed lounge space. Meanwhile, the impressive beach club, usually reserved for larger superyachts, allows guests to comfortably move between the yacht and the water. The yacht is well equipped to offer watersports for children and adults alike, including the support of her 10.3 metre Technohull chase boat. Like many of the superyachts available for charter in Australia, MOHASUWEI’s homeport is Sydney and the yacht will be available in the Harbour, Pittwater (north of Sydney), the Whitsunday Islands and Great Barrier Reef. “MOHASUWEI’s silhouette is distinctly Italian and she is distinguished in the market for this reason. However, it is her interior which is truly spectacular. Her Owners undertook an extensive interior refit and the yacht now exudes casual charm and elegance not to mention an impressive display of vintage photography,” offered Mr Joachim Howard, Managing Director of Ocean Alliance. Australia’s superyacht charter market has rapidly grown in recent years and Ocean Alliance has continued to be a leader in charter management and marketing. Australia is often considered a year-round cruising destination as yachts can chase the summer weather. From April to October, chartering superyachts head north to the Great Barrier Reef and the Whitsunday Islands on the east coast, or to The Kimberley and Ningaloo Reef on the west coast. This is when the Humpback and unique populations of dwarf Minke Whales are migrating and the visibility for divers is optimum. From November to March, the temperatures in northern Australia encourage the yachts south to enjoy the more temperate climate and events such as New Year’s Eve on Sydney Harbour, the Australian Open and the Rolex Sydney to Hobart Yacht Race. “The Owners are passionate about cruising in Australia and want to promote Australia as a luxury travel destination. It is perhaps something unique to the Australian yachting scene – Owners become advocates for the country,” stated Captain Matt Conroy of MOHASUWEI.